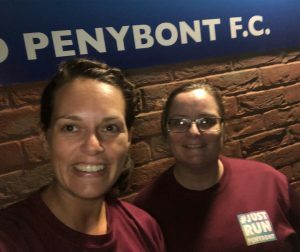 November’s Run Wales Group of The Month are Just Run Penybont, who meet on Tuesdays and Thursdays at 7.30pm at Penybont Football Club, Bryntirion. The group was set up in September by Emma Marshall and Stephne Puddy in order to offer new runners the opportunity to start their running journeys in an environment that required less commitment than that often found within more established running clubs. 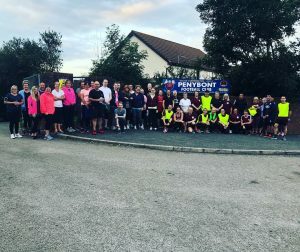 Emma and Stephne became run leaders to help and encourage people who wanted to start running, or improve their running, and Just Run Penybont have given them the opportunity to do this on a larger scale. “Seeing the huge improvement made week after week, makes us extremely proud of our group and our run leaders. Lovely friendships have been formed and the support they give each other is amazing. To us running isn’t about pushing for faster times or encouraging our members to run competitively, it’s about offering a relaxed, friendly place where you won’t be judged if you walk or if your pace is slower. Nominated by Run Wales Activator Sharon Leech, the group continues to grow, with members inspiring each other and group leaders doing a fantastic job of motivating and encouraging their groups.